Image caption Police condemned the vandalism as "appalling" and "dangerous"
Broken glass has been glued to a slide and swings in a children's play area in Liverpool, police said. Merseyside Police condemned the incident in Seeds Lane Park on Long Moor Lane in Fazakerley as "appalling" and "dangerous". 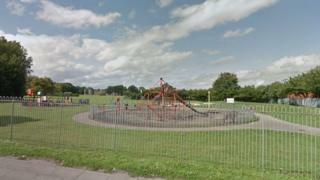 Officers think the glass was glued to the play equipment between 17:00 BST on 13 April and 09:00 BST on 14 April. The criminal damage was reported to police on 15 April. The park is located near Aintree racecourse. Det Insp Graeme Towndrow of Merseyside Police said: "Thankfully this is a hugely rare occurrence and no one was hurt. "Despite this, I am really concerned that someone would even consider doing this. "This is absolutely appalling, dangerous and careless behaviour which could have caused serious injuries to children trying to enjoy the park."